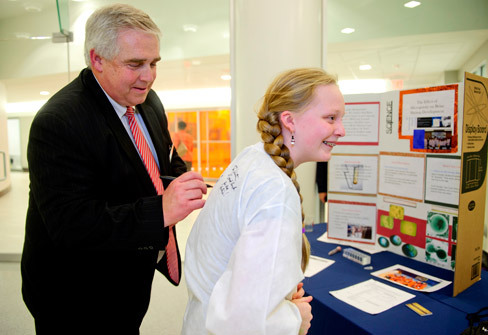 Founding dean of the Joint School of Nanoscience and Nanoengineering Dr. James G. Ryan signs an autograph for a Mendenhall Middle School student who participated in a project involving the final flight of the space shuttle Endeavor. Read the Last in Flight story to learn more. UNCG celebrated the opening of the $56.3 million Joint School of Nanoscience and Nanoengineering facility on December 7 with featured speakers Governor Perdue, Senate Pro Tem Berger and Speaker Brubaker. An open house the following day brought more than 400 people from around the community. In April, JSNN was recognized with the prestigious 2012 Star Award, a top honor for state construction projects. In its second year of operation, the nanoscience academic programs have 29 students enrolled. The first Professional Master's student, Sita Lakkaraju, graduated earlier this month. The first year for the nanoengineering degree programs saw strong student interest. The MS in nanoengineering degree program began in August 2011 with seven students. Its first graduates are expected in August 2012. In addition, the PhD in nanoengineering received Board of Governors approval in Fall 2011 and is now underway with 12 students. JSNN has created more than 40 jobs this year, leveraging its grant support, recurring and non-recurring budgets. The nanoscience department secured research funding from the Semiconductor Research Corporation, EPA, The American Heart Association and NCBC. JSNN is also working closely with Gateway University Research Park to develop partnerships with high technology firms. JSNN's research on the development of a diagnostic device for traumatic brain injury (a collaborative project between UNCG and NC A&T faculty) has attracted interest from funding agencies and industrial entities. Horiba Scientific has provided a Letter of Intent to develop a relationship with JSNN involving this technology. JSNN continued its academic outreach work with Guilford County Schools and with organizations such as the Kiwanis regarding methods to expose middle school students to nanotechnology concepts. The Kiwanis also plan to establish a scholarship for a JSNN graduate student who is also a graduate of the Guilford County Schools. In addition, JSNN worked with GTCC and Forsyth Tech students to provide hands-on training through internship opportunities and also established agreements with two universities (Bharati Vidyapeeth University and Rensselaer Polytechnic Institute) to promote academic collaboration.